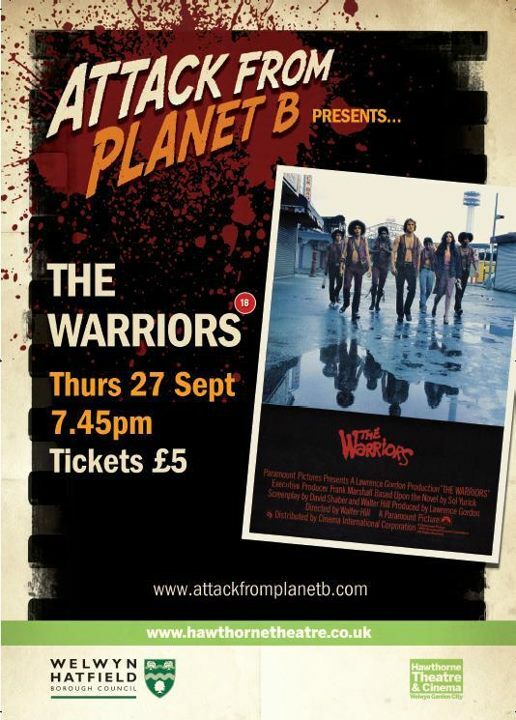 Attack From Planet B is very proud to present its second screening event for our great followers and we are opening with a classic, The Warriors. What we want you to do is turn up to our screening on Thursday 27th September at 7.45pm . So come along to the Hawthorne Theatre in Welwyn Garden City (directions below) on Thursday 27th September at 7.45pm, with tickets at only £5 what are you waiting for? Order your tickets here. Over the next couple of months keep the your diaries free for the first Thursday of every month, as we will be bring you more great screenings at The Hawthorne Theatre with our next screening being the horror classic Halloween, with more to come.